When you can't get out to ride during the winter, your body can get out of shape quickly. Fitness and mountain biking go hand in hand. Check out these 3 resources to help you reach your goals, whether it's getting in shape or making it to the top of Copeland Forest's mile high bike trail with no breaks. 1. Raw Crossfit CrossFit is the principal strength and conditioning program for many police academies and tactical operations teams, military special operations units, champion martial artists, and hundreds of other elite and professional athletes worldwide. 2. bikejames.com A two day, strength training program for mountain bikers from MTB Strength Training System creator James Wilson. A serious mountain bike strength training program. 3. Insanity No No Gym, No Problem The hardest workout program ever put on DVD, no gym required. Crownland Forest has some of the best riding in Southern Ontario, and I like to think of it as home to the CTS bike club. Crownland Forest is super in the spring, fabulous in the fall and where we ride 90% of the time. 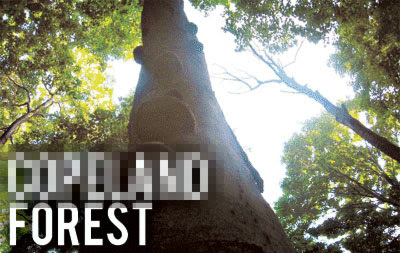 The forest if full of lush undergrowth, towering old trees and of course sick single track. Crownland was the first place I ever rode single track and it blew my mind, it continues to blow my mind even now even after five seasons of riding Crownland forest we continue to find new trails almost every ride. Crownland has everything from beginner to pro, and I find that the trails are best experienced starting at the intermediate level. There are huge climbs that seem endless which can be combined with rippin' fast descents. With over 50km of single track, there is enough trails to put together a full day of epic riding. The CTS riders choice awards. At the 2010 CTS banquet Sept 12th. You decided the winners. Now here's the video. MTB training, like many other sports, has a lot of misconceptions or myths surround it. When someone decides that they want to become better on the trails they are usually told these three myths. "To become a better rider you must..."
1. Work on your cardio: While cardio is important, the real key to riding faster and longer is to achieve better efficiency on the trail. You can compare your cardio to the size of your gas tank and your efficiency is the mile per gallon. You get more by working on both cardio and efficiency rather than simply adding more gas to the tank. 2. 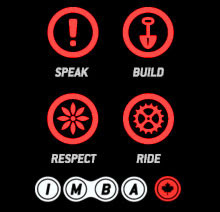 Ride your bike more: Getting out on your bike is a must, but when new riders first start every time they go out for a ride they feel like they are improving. However, after a year or so of riding most people have maxed out their current fitness and skill levels, and the improvement stops. Strength conditioning is the most efficient uses of your mountain bike training time and can dramatically raise your performance. 3. Get a bike fit: Bike fits are great – if you're a roadie. Mountain biking requires a high technical skill level and you want your bike set up to best fit this need, not to work around your mobility and movement deficits. Most bike fits looks to change how the bike is set up around you regardless of how those changes affect the balance and handling on the trail. Some of the most common bike fit "fixes", such as changing stem length, will negatively affect your ability to corner and handle your bike. It is rarely the fit that is holding a rider back; it is more often the tight and weak rider that is holding the bike back. 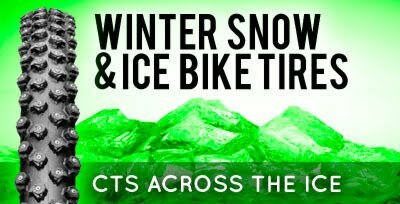 For those hearty CTS members that keep riding regardless of the weather, specially designed tires for riding on snow and ice can help maintain traction under treacherous conditions. Studded snow tires are available commercially, But can be costly. A more cost effective option is to make them yourself. If you have an old set of tires kickin' around you can do-it-yourself by running small machine screws through a tire from the inside out. Whether you buy or make studded tires you'll want to use these tires only when there is ice and snow present. Running around with them on dry pavement will make a lot of noise, wear down the studs or damage the tire. You may want to look into getting or making a pair before our first annual "Across the ice" trip. I bought a pair last winter and they made a huge difference. A good pair of snow/ice tires can turn a snow packed sidewalk into a rippin' section of single track. When the temperatures drop, don’t give up mountain biking. 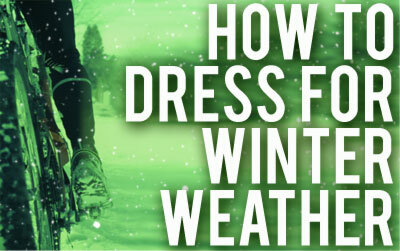 Learn how to dress for winter weather! Base Layer: Choose a base layer that fits tight and will wick perspiration away from your body to keep you dry. Insulating Layer: This layer is meant to keep you warm and also keep moisture away from your skin. It shouldn’t fit as snugly as your base layer. A wool jersey/sweater, or a fleece will do the job. Outer Layer: Your outermost layer of clothing should be windproof and waterproof. Hot Head: The big holes in our helmets are designed to keep our heads cool in the summer, however, they can make you head too cold during the winter. Wear a balaclava or headband under your helmet. Icicle Hands: On your hands, choose a pair of wind and waterproof gloves. Shifting will keep you from wearing mittens, though they keep your hands the warmest. You can also choose to wear a lobster style glove, this two finger lobster style offers increased finger warmth (inner liner still has five fingers) but still allows you mobility to shift gears. Happy Feet: Don’t overlook your feet as they will likely get cold first. Choose thicker winter socks or double up on two thin pairs. Wear a pair of shoe covers over top of your mountain bike shoes to keep your feet warm and dry.